With Karen + Andrew’s new cookbook, though, I’ve been seriously whizzing through my produce this month. Not only am I inspired to cook more often–I’m also inspired to try out new (and guaranteed awesome) flavor profiles that help me take full advantage of my stocked (but usually untouched) pantry! All being said and done, I am SO ready for this weekend. Who’s with me? As I mentioned earlier this week, I’m spending all day tomorrow at the California Strawberry Festival’s annual cooking competition finals–one of the local reporters even published an article today of me Instagramming my coconut strawberry cake at the semi-finals, LOL. Ummm, meta much? And yo-ho, me hearties, I wish you a big hearty bowl of this broccoli-inspired awesomeness. And wine. Most definitely the wine. And enter this giveaway below, because honestly–who doesn’t love free awesome cookbooks? What about you: what’s your favorite vegetarian flavor combo? Share your thoughts in the comments! This giveaway is sponsored by Karen & Andrew, as well as their publisher, Little Brown & Company. I received a free copy of this cookbook to use and review. As always, all opinions expressed in this post are 100% my own. 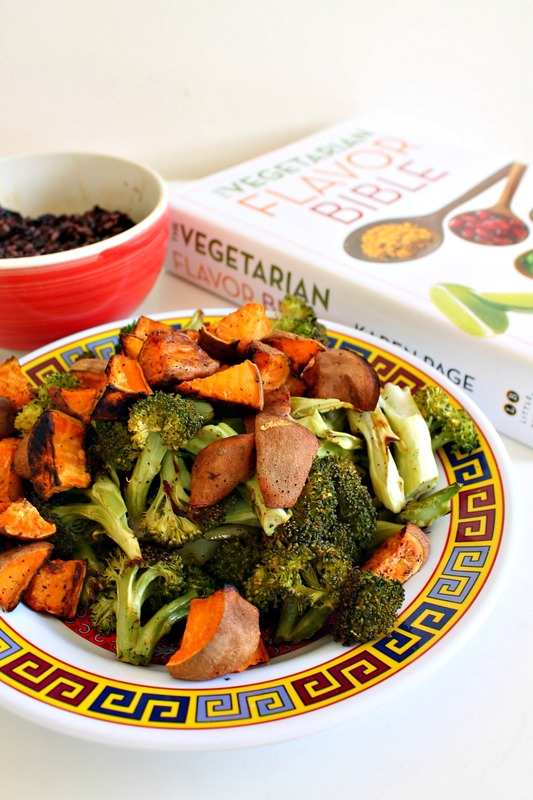 Inspired by "The Vegetarian Flavor Bible," this veggie bowl just rocks! 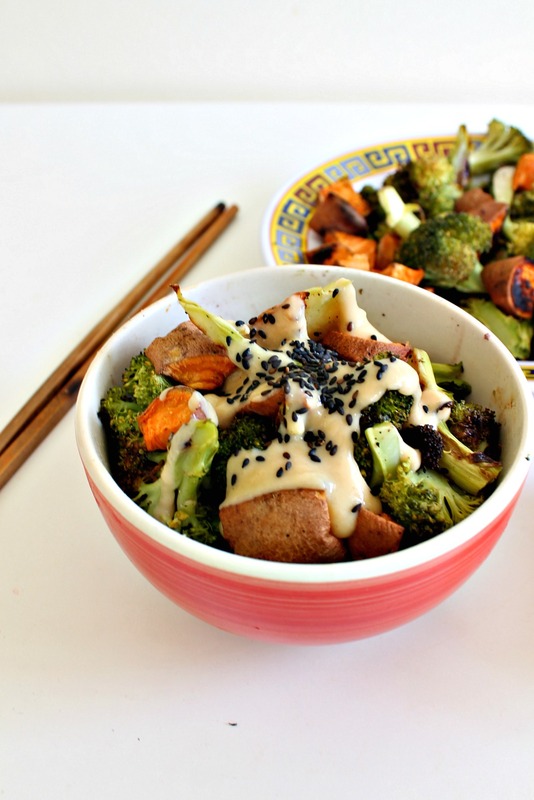 It's nutty, tangy, salty, and perfectly balanced with the flavors of roasted broccoli, sweet potato, miso, and sesame. Perfect for a filling but perfectly healthy lunch or dinner! Cook rice in rice cooker according to instructions. Continue preparing the rest of the bowl as you wait. Preheat oven to 375 degrees F. Wash and cut both your broccoli and sweet potatoes as you normally would, making sure to cut into bite-sized pieces. Place sweet potatoes only (not the broccoli) on a lightly greased baking sheet or pan and drizzle with olive oil, salt, and pepper (to taste). Bake in oven for 20 minutes, flipping over with a spatula once at the halfway mark. Add broccoli to the pan (drizzle with more oil, salt, and pepper if desired) and continue roasting the vegetables for another 30-40 minutes, until vegetables are tender but not mushy. Remove from oven. Combine all ingredients in a medium bowl until smooth. Pour over vegetable bowl and enjoy right away! 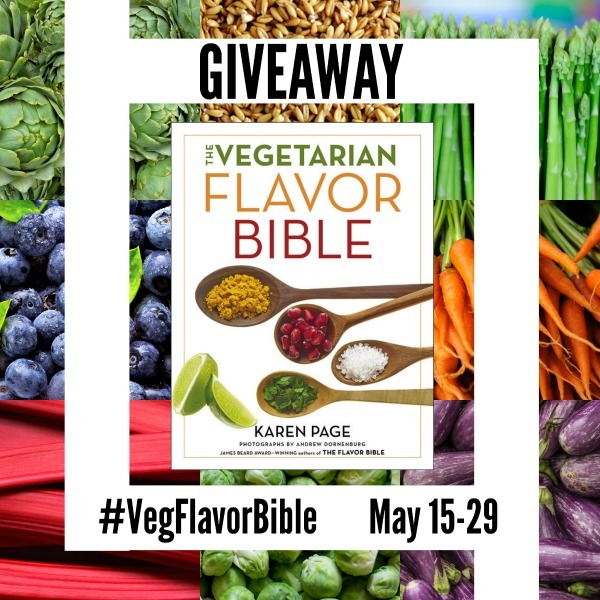 Be sure to check out all the AWESOME vegetarian recipes my fellow bloggers are sharing today, inspired by The Vegetarian Flavor Bible! Good luck at the strawberry festival cook off, Ala! You are going to wow them, I know! I’m an impulse shopper too, especially of new or unusual produce, but I was given a bag of black rice ages ago and there it sits in my cupboard, clearly just waiting for this recipe. A lot of great flavors going on here! Oh, and, of course, there will be wine! Great recipe- love the flavor affinities! 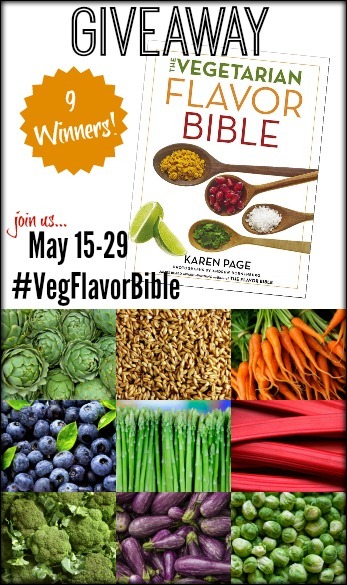 Page and Dornenburg are really good authors — their Flavor Bible is excellent. Glad to hear they have a vegetarian version! Sigh — forgot to turn of the ital for the title. 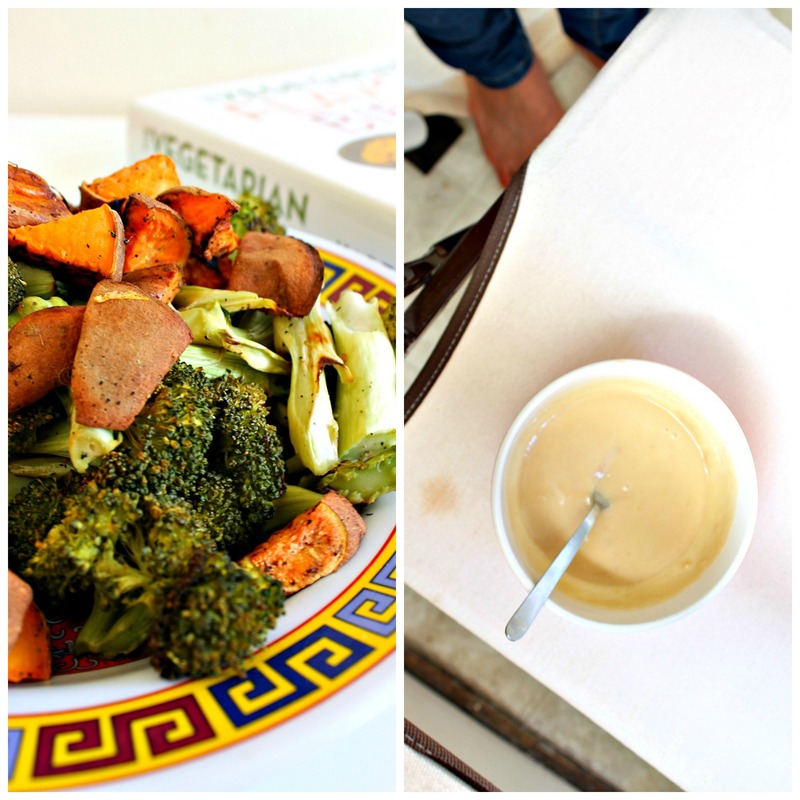 Sweet potatoes and broccoli are two of the things I crave…so this looks like the perfect meal to me! your bowl looks delicious. what a combination of flavors. I don’t even know what my favorite vegan/vegetarian dish is. I’m not either, but my diet is more vegetarian oriented. So a lot of the food I eat are vegetarian/vegan. I own the Flavor Bible and it is soo amazing and inspiring! 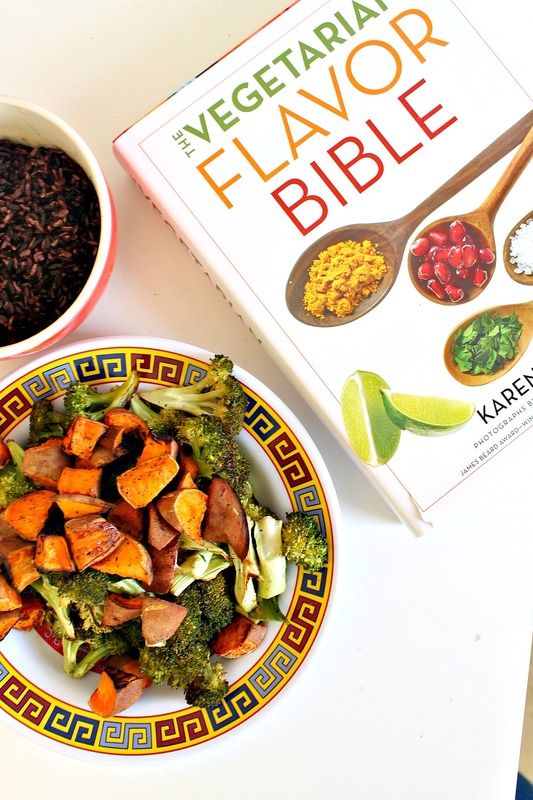 I’ve never had black rice before, but I’m soo tempted by your recipe! God luck in the competition! 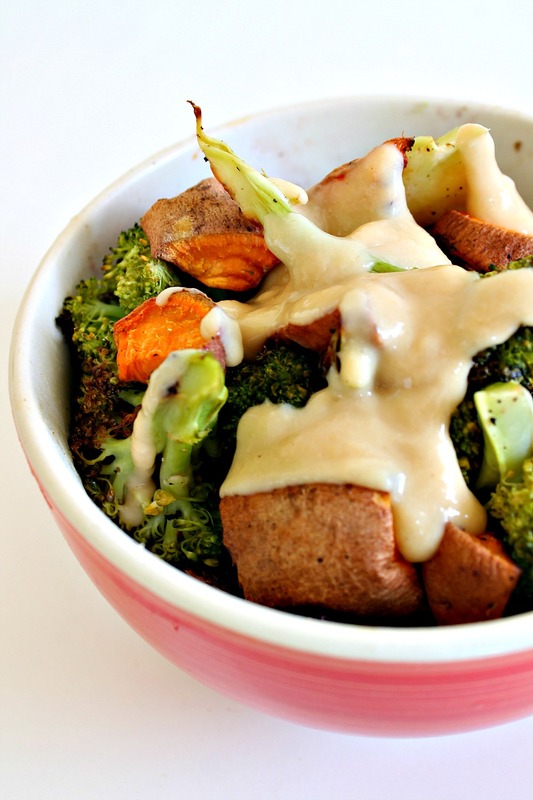 That bowl of broccoli and sweet potatoes looks delicious! My favorite veggie dish at the moment? Steamed edamame in the shell with olive oil and sea salt. Or coleslaw with apple and horseradish. Or baked yellow squash. Yum! Thanks for the chance to win such great books. Hope the competition went well yesterday! Love these rice bowls! I love a good quinoa salad with all kinds of roasted veggies mixed in – broccoli, brussels, asparagus, sweet potatos…I love it ALL! Perfect, me too! Good luck, Vera! I never would have thought that these flavors would go together – what a great dish! Me neither–and yet, here we (fortunately) are! Have a lovely Monday, Alice!! Oooh I love everything about this combo! I don’t see enough with black rice and it looks awesome here! Great post! I’m totally feeling you on this one–black rice is the BEST! Whoo, thanks Anna! Hope you’re having a wonderful week! I am obsessed with miso lately, I went to the Asian shop earlier today and bought the biggest tub I could find. When I hit google looking for fun ways to use the paste, your blog came up in the search. I squealed with delight that I ‘know’ you. 🙂 Looking forward to trying the recipe lovely one. OMG you’re kidding. Sorry, my heart stopped for a sec when I read that. That’s so exciting, hehe. Thanks for reporting on it, Annaaaaa! This is so up my street. I may need to make this soon!